Our kennel area currently includes 14 dog runs measuring 5X8. 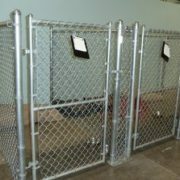 The kennels have the soothing sounds of classical music and soft lighting to promote relaxation. Double occupancy rates for smaller sized dogs are also available. 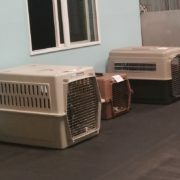 InBark is proud to offer crate boarding for dogs of all sizes. ** Our boarding suite is currently undergoing updates. More information on suite boarding will be available soon. All boarding rates include daycare! Non-Peak: Cancellations made less than 48 hours in advance will be charged 25% of boarding fees. Peak: Cancellations made less than 5 days in advance will be charged 50% of boarding fees. Peak boarding dates include all major holidays, Spring Break, and summer. Boarded dogs can be dropped-off or picked-up by appointment on Sundays between the hours of 8:00am and 11:00am, and between 2:30pm and 5:30pm.